As Canada celebrates its recent nationwide legalization of cannabis, Canadian portable vaporizer manufacturers Vapium recently released the Lite for use with dry herbs. The aesthetics on this unit are similar to the Pax 3 in that it looks slick, is pretty discreet, and is all black. The Vapuim Lite costs much less than the Pax 3, though. Who is the Vapium Lite for, and is it right for you? Read on and judge for yourself! The Vapium Lite uses conduction heating and its oven is made of ceramic. It takes about 45 seconds to heat up, and haptic feedback tells you when it’s ready to rip. 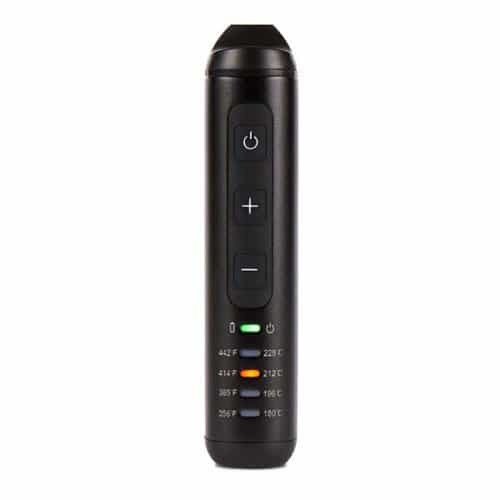 The Vapium Lite uses preset heat settings, and its temperature range is from 180 C to 228 C. You won’t get precision controls from the Lite like you will with more expensive units, but that’s not really what the unit is going for anyway. As previously mentioned, the Vapium Lite is very sleek and stylish looking while also being pretty discreet as well. The dimensions on the Lite are 10 cm x 2.2 cm x 3.6 cm, which is nice and compact. You’ll have no problem storing the Lite in your pocket, backpack or handbag. In addition, the rounded corners on the Vapium Lite fit comfortably in the palm of most hands. When purchasing this device, you get the unit itself, a glass water pipe adapter, and a handy tool for stirring your herbs, a cleaning brush and a charging cable. That’s a fair amount of accessories for an inexpensive dry herb portable vaporizer. The Vapium Lite is perfect for beginners because it’s very simple to load and use. The buttons are easily visible no matter how bad your eyesight might be, which leaves nothing up to the imagination or no real need to read the instruction manual to figure out how to use the unit. It’s also clear as to which LED light applies to which temperature range. Just remove the mouthpiece top, load your dry herbs, choose a preset temperature, and you’re good to go in about 45 seconds. Again, there really is no need for any kind of lengthy instructions on this one – just load it and go. You’ll want to grind your herbs down as finely as possible with the Lite, to make sure you get the best possible rips. The Lite comes with a water pipe adapter, which we found to be a bit odd on a model like this. We love to see added accessories because our customers love that as well, but water pipe adapters are typically something that are used by more experienced vaporizer enthusiasts. Newbies will probably not use the glass water pipe adapter all that much – in fact, they might even end up forgetting about it altogether. The chamber on the Vapium Lite can fit up to 0.33 grams, which is solid and should be enough for a one session for most tokers. We weren’t too crazy about the overall vapor quality of the Lite, however. We suspect that its lack of deep, flavorful rips is likely due to the fact that the Lite uses a silicone air path and a plastic mouthpiece. While the vapor itself is pure, the taste and flavor of hits on this one leave a lot to be desired. The Vapium Lite features a built-in stirring tool which is very convenient for stirring your herb inside the chamber and to get the most out of your dry herbs. Since this unit is primarily designed for use by newbies, the cleaning and maintenance of the Vapium Lite is just as easy as it is to load up and use. The included cleaning brush actually works quite well, unlike that of other entry-level devices. We recommend giving the mouthpiece and other non-electrical parts of the device a soak in alcohol after about every other full charge. The 18500-mAh battery is solid on this device, lasting around a dozen sessions and charges up in about an hour. The Vapim Lite is affordable, so it doesn’t have all the bells and whistles of your more expensive units. And for the vast majority of newbies, that is perfectly okay. This unit really isn’t designed for a vaporizer connoisseur who has the latest and greatest anyway. The Lite is a great choice for those interested in getting into the vaporizer world without breaking the bank. For its minor flaws and shortcomings, it’s a solid first vaporizer. And as you probably already know, switching from smoking to vaping is always a great decision. If you’re looking for information about the Vapium Lite make sure to head over to our product page here. Follow Tools 420 on Social! If you’re new to the vaporizer world and you need some advice on the best device for you, check out our buyer’s guide. Follow our Facebook, Twitter and Instagram pages and signup to our Newsletter to receive more news, updates and promotions. You could even win a prize! Check back right here to Tools420 often because we update our pages frequently. Until next time, it’s 4:20 somewhere! Happy vaping!